On June 17, 2013, the National Institute for Occupational Safety and Health (NIOSH) announced the release of a free Ladder Safety app that helps reduce the risk of injuries by ensuring extension ladders are properly positioned. The app uses audio and visual signals to check angles when using an extension ladder. Angling ladders too steeply or shallowly can increase the likelihood for falls. In addition to providing placement feedback, the app offers ladder safety tips, a ladder selection guide, and references for inspection, accessories, and proper use. NIOSH collaborated with the ANSI A14 committee on Ladder Safety, the American Ladder Institute, DS Federal, and other stakeholders to develop the app and it’s available for both iPhone and Android smart phones. Falls are one of the major causes of injuries in construction. 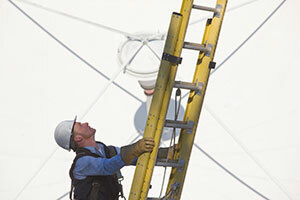 Keep workers safe when using ladders by providing information, training, and the proper fall protection.